Sometimes our bodies need to rest and our mind needs to switch off from the everyday stresses of life. Heated Lava Shells are a perfect way to relax and can help release tension in the body. The heating properties of the lava shells means the massage is more effective in relieving muscle tension and soreness and can be effective for those who suffer with chronic headache, lower back pain or discomfort. Lava shell is a 100% natural tiger clam shell and is sourced in the Philippines. They heat up with a mixture of magnesium, iron and minerals of sea kelp and algae that are activated by a saline solution that is poured into the shell. This forms an exothermic reaction which creates the heat. For the ultimate calming massage, the Lava Shells Relax treatment is the soothing solution. During the massage, the shells are worked over the palms, arms, neck and shoulder area, with the focus of the massage surrounding pressure points. This full body massage combines the heat from the shells and deep tissue work to ease away any muscular tension, knots and stress points. Prepare to be transported to the tropics with essences of green tea and mango that will create a sense of balance to the entire body and mind. Choose a 60 or 90 minute treatment for an unforgettable and sublime experience. This is the ultimate Lava Shells experience for both the face and body. The warm lava shells deep tissue massage works over pressure points in the palms, arms, neck and shoulder area, as well as the feet to induce total relaxation. This is combined with a gentle facial massage to help stimulate circulation, ease tension lines and boost natural radiance. This treatment is ideal to add to your Hot Lava Shell Massage if you are suffering from bloating or sluggish digestive system. Heated lava shells are used to massage the abdominal area and can help improve circulation. The combination of soothing heat and gentle massage helps stimulate the body’s natural systems to effectively eliminate toxins to promote wellness and balance. I’ve had my eyelashes done by Sandy for a wedding recently and I couldn’t believe how natural they looked. Sandy blended in a range of sizes that added length and thickness to my lashes. Even my friends didn’t know they were not real. Not only did I have longer lashes but the whole affect gave an immediate lift to my eyes. I wouldn’t dream of going anywhere else. Thank you! I have been having lava shell massages with Sandy for 6 months. I work extremely long hours and and my job in the City is very demanding. Sitting in front of a computer screen most of the time probably adds to the neck aches I frequently get. 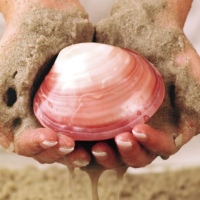 The nurturing touch of Sandy’s hands and the heat from the shells is blissful. It’s also a great way to keep the body warm and detoxify. Highly recommended. A unique selection of essential oils will be blended to stimulate your senses with relaxing massage techniques to restore balance and harmony to the body. Aromatherapy helps to restore the body’s natural balance whilst offering an effective, relaxing and sensuous experience.